Here are some perspectives from which to view the volcanic eruption in Iceland and the troublesome clouds it has sent off into the surrounding skies. • Mother Earth is readjusting her girdle. Most likely, the volcanic activity of Eyjafjjoell is connected with the recurring recent geologic turmoil noted from Indonesia to China to Haiti and around the world. Iceland is in a sense the tip of the “iceberg.” You may chalk up the eruption as simply terrene turmoil or see it connected via strata around the Earth and within it as well. • The Atlantic skies needed a lull in traffic. Who knows? We do know that the clouds from Eyjafjjoell cleared the skies of airliners in the northeast Atlantic for most of a week. Humans don’t know very well to slow down or stop unless disease, disruption or injury get in our way as individuals and as groups. Maybe a break was needed. Or, maybe the real “break” had already occurred. • The lid is coming off an explosive situation which has been bottled up. We can see this happen in human lives and family situations. Maybe it’s like a boil coming to a head. Maybe the Icelandic and other ventings in recent times are metaphors for things lying beneath the surface in the larger Earth world. Interestingly and maybe synchronistically, the Icelandic clouds took center stage in the media at the same time the US Securities and Exchange Commission brought suit against Goldman Sachs investment bank. • Toxic winds are blowing toward the European continent. We might want to remember (or recognize if we hadn’t noticed) that big financial problems hit Iceland harder and faster than other European countries. In fact, Iceland’s banking collapse has been the largest suffered by any country in economic history. Beginning in 2008, Iceland’s three banks were nationalized. The country has a HUGE external debt (6 times annual GDP), 80 percent of which is owed by those banks. Its citizens voted in March against paying off $5 billion dollars owed to Britain and the Netherlands. • Fallout is spreading around the Earth at many levels. Iceland has forestalled bankruptcy for the moment while its economy sinks into serious recession. Like Greece, which is now in the news regularly along with the other PIIGS countries (Portugal, Ireland, Italy and Spain), Iceland has borrowed and spent profligately in recent decades and is now beginning to see the effects. Sound familiar? • What goes around is coming around. It was little over twenty years ago when the Iron Curtain fell and Soviet Communism died a rather sudden death. Westerners pointed fingers and said, “I told you so.” But now, it seems that capitalistic consumerism, which in large part caused people in Communist countries to tear down the walls, is not only very sick but not far from the grave as well. The problems facing Iceland physically and financially not only have “ripple effects” but also direct connections to our own. • No island is an island. While Iceland is a small and remote North Atlantic island with a few hundred thousand people, it is a mirror of the whole Western world. Island it is. But in the early 21st century, Iceland may be a microcosm for the rest of the world to consider. Speculation, greed, and excess know no boundaries. Spending has become king. But, the kings have to pay the piper too. Eventually. 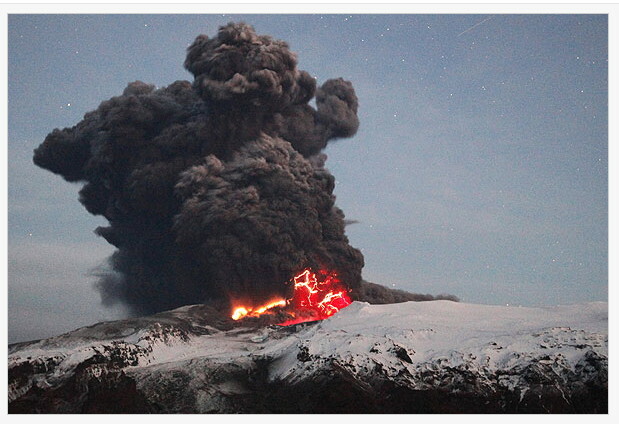 A few notes follow based on the natal horoscope for Iceland and transits for the time of volcanic cloud. Iceland became an independent nation near the end of World War II. Some quick notes may be worth considering in the midst of the present situation. • The chart is top heavy. All planets are located above the Horizon in the Southern Hemisphere. This country is out of balance. • Mercury is the Sole Dispositor of the chart. A Mercurial nation in more than one way. • Neptune is tightly conjunct (less than a degree) of the Ascendant. Suggesting many things, but most obviously beging dependent upon The Waters. At the time of the Volcanic Cloud, a fateful Yod is posted to the grim reaper Saturn. A T-Square points to Pluto, King of the Underworld. Neptune and Chiron are conjunct in electric Aquarius (they have been running together for months now). 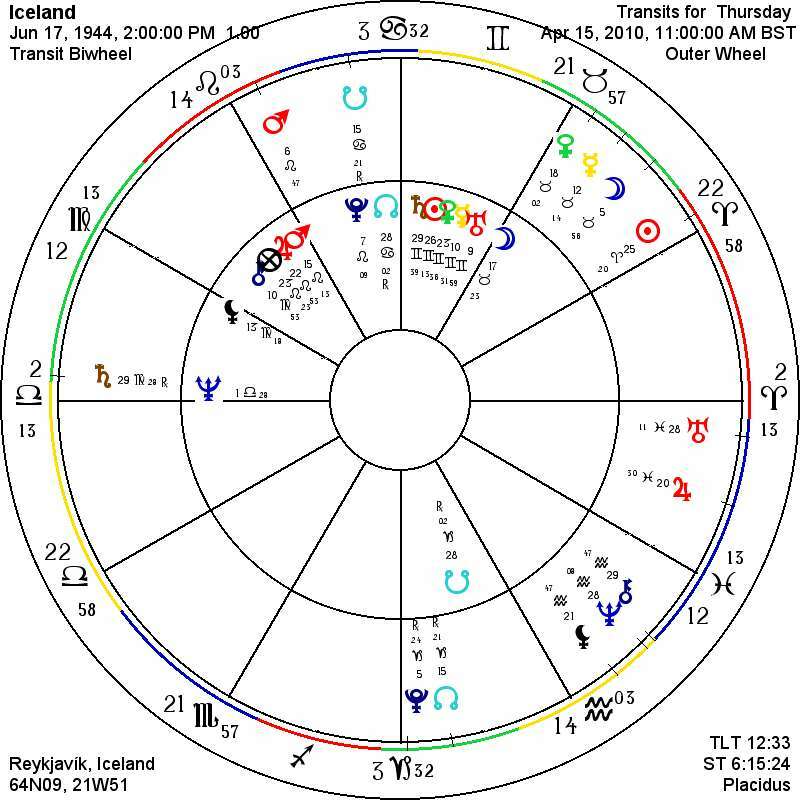 • That Pluto T-Square makes a challenging Grand Cross to Iceland’s natal Midheaven. Lunar Nodes have been crossing each other in recent as well. • Saturn is criss-crossing the natal Ascendant. Uranus is oppsing Saturn and the Ascendant. Lots of turmoil, challenges and opportunities for Iceland and for the whole world. We are all connected.